I've always found that becoming overwhelmed is the biggest obstacle I have in achieving the things I want to do in life. It always seems like such a good idea at the time, but once I start to dig deeper into what is involved in doing it, I become overwhelmed with information... and I often freeze to the spot. Has that happened to you? Well, you certainly are not alone! 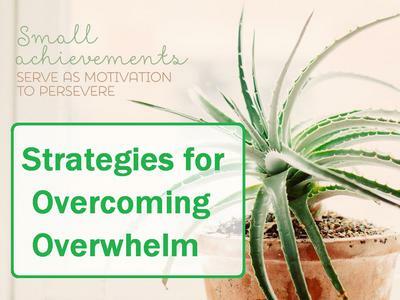 Trying to overcome overwhelm is one of the hardest things to do in life... and it is a Life Skill that you MUST learn if you want to be successful in life and in your career. Not negotiable. So join me now in discovering how to beat it! Here are ten helpful strategies to take action on if you have so much going on that you feel overwhelmed. Work, family, and other obligations can prove to be too much at times. A busy life with too many demands can lead to feeling overwhelmed and stressed. Working even harder to rectify the situation seems unreasonable when you feel as if you're already working at full capacity. Just remember that you've felt overwhelmed in the past and made it through to the other side. Things get better. Once you start to feel overwhelmed, things tend to go downhill quickly. Give yourself a break by relaxing, taking a deep breath, and slowing down your brain. Scan your environment and describe it to yourself. It will disengage your mind from your stressors and bring it back to reality. 2. Focus on what you can do. In any situation, there are things you can control and things you can't control. Keep your focus on those things within your influence. 3. Let go of those things that are out of your control. There's no reason to think about it and get yourself more agitated if you can't do anything about it. Learn to let go of anything you can't influence. Most of us make the mistake of focusing on the problem and imagining negative outcomes. This strategy decreases your capability and causes even more stress. If you're going to put your brain to work, use it to find the best possible solution! Ask yourself what you can do to eliminate or lessen the sources of your stress. Write down your ideas. Are things actually as stressful as you think they are? Is it possible that you've misinterpreted the facts or made poor assumptions? Gather all the facts before deciding if there's a reason to be overwhelmed. Question your judgment and ensure that you're on solid ground before hitting the panic button. 6. Give yourself a change of scenery. Get out of the house and the office for a few hours. Your environment affects your perspective. Spend some time in nature if possible. 7. Spend time with a friend. Go out for pizza and movie with a good friend. Rely on those in your social circle for advice, comfort, and a quick distraction. Which of your friends is best at making you feel better? 8. Take part in a relaxing activity. What relaxes you? Lying on the couch with your headphones? Going for a run? Getting a massage? Spend an hour or two decompressing and you'll feel better. 9. Cut down on your obligations. Maybe you're trying to do too much. Consider limiting the number of activities you participate in. Are you taking on too many responsibilities at work? Consider which of your obligations are most important and get rid of the rest. 10. Remember when you've been overwhelmed in the past. You survived. In fact, you might even laugh today about how stressed you were back then. Hindsight is 20-20. Consider that you're likely to feel the same way in the future regarding your current situation. Slow your mind and take a deep breath when first faced with feelings of overwhelm. Try to maintain an objective perspective. It's easy to get carried away when you're feeling stressed! Take a timeout and make a list of the items you can control. Search for solutions that address those items. Let go of those items you can't control. Rely on friends and family to help you cope, since you'd do the same for them. Since suffering from burn out (depression) many years ago, my stress tolerance levels are not what they used to be and I have had to learn strategies to get through moments of overwhelm etc. and as I am getting older and less physically able I still need to keep my mind active which can be just as taxing. What Helene has outlined here is exactly what I use to overcome anxiety and overwhelm before it escalates into full blown depression. Thank you Margie for your feedback, I'm so glad it resonates with you. Hope you keep coming back for more, I look forward to hearing more from you over time!